That's DOCTOR Goodes, to you. Sydney Swans icon, community hero, anti-racism campaigner, 2014 Australian of the Year and general all-round legend Adam Goodes has added another title to his already glittering CV -- doctor. 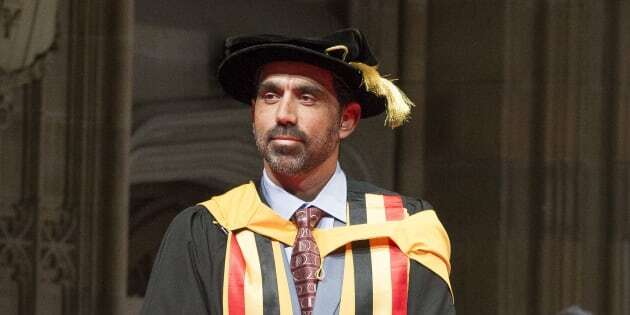 Goodes, one of the most talented players to ever lace up a boot, was awarded an honorary doctorate from the Faculty of Health Sciences at the University of Sydney at a ceremony on Thursday night. The Adnyamathanha and Narungga man was named a Doctor of Health Sciences (honoris causa) for his work in supporting the Indigenous community, for his charity work, his community leadership and his illustrious sporting exploits. He represented the Swans in 372 games in a 16-year career, which included captaining the team between 2009 and 2012, winning two premierships, two Brownlow medals, and being named in the Indigenous team of the century. But Goodes may be remembered just as well for his off-field actions, which included having to respond with grace and poise to multiple incidents of racism, being named Australian of the Year in 2014, working with Indigenous youth, and his GO Foundation with his cousin and former team-mate Michael O'Loughlin which provides scholarships to Aboriginal kids. "Adam is a champion on and off the field. His sporting achievements are remarkable but do not define him entirely, he is larger than football," said Vice-Chancellor and Principal Dr Michael Spence in awarding the doctorate on Thursday. "His dedication to human rights, the fight against racism and to helping young Aboriginal people, have made an indelible mark on the Australian landscape." Professor Kathryn Refshauge, Dean of the Faculty of Health Sciences, also praised the former Swans skipper. "Adam is a leader and highly respected role model, not only for the Aboriginal community but also for the wider Australian community," she said. "He embodies the creativity, courage and determination we hope to see in our graduates." In accepting the doctorate, Goodes spoke about the importance of education. "In my opinion, education is the absolute underlying key for people to achieve their goals," he said. "Not just because it provides them with a knowledge and understanding of the world and the people around them, but also because it enables people to dream, and dream big. Dream about things that they otherwise wouldn't dream about. But it's the foundation for achieving our dreams, not the guarantee."